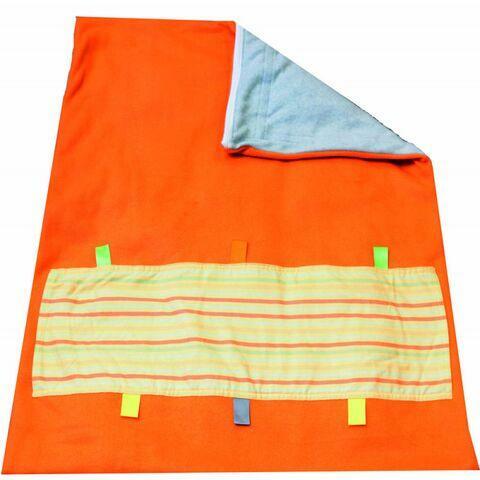 We have updated our Soft Touch Weighted Blanket which now comes in soft, comfortable double-sided fleece in either soothing blue and green or sporty orange and gray. At customers’ requests, we’ve added a pocket and tags for added tactile opportunities and places to attach your favorite fidget toys. There is even a tag inside where you can hook a small fidget toy to keep active hands occupied. span If you don't want the pocket with tags, no problem. Choose the Soft Touch Blanket without the pocket (see at right). /span The inside is still our unique weighted, non-toxic gel insert with a tough nylon cover with Velcro to secure to the cover. The cover can be removed for machine washing in warm water and line dried. Additional covers can be purchased separately. Made in the USA. Dimensions: L: 32" X 52"